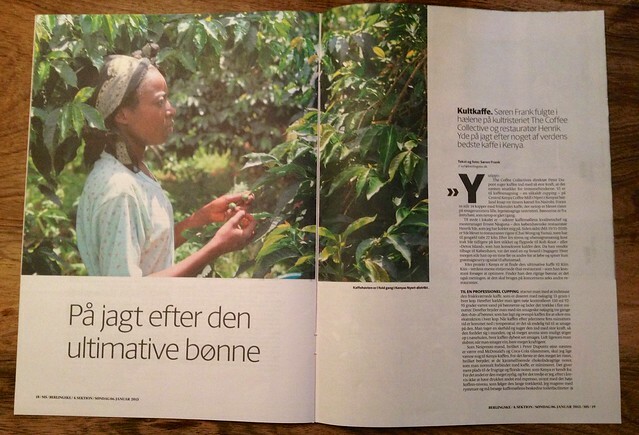 On January 6th one of Denmark's biggest newspapers Berlingske Tidende published a great article on coffee. Food and wine reviewer Søren Frank had followed our director Peter Dupont and michelin star chef Henrik Yde on their trip to Kenya. The result became a five full page article detailing how coffee is grown and processed in Nyeri, Kenya as well as the work that goes into cupping and sourcing the best lots. During harvest there usually isn't much to cup, but this year we wanted to discover more about the work happening at that crucial time. We can always cup the lots back home. However, there was several lots that they were already drying and possible to cup, but the final purchasing decisions and lot selection won't happen until the lots are fully dried and processed at the CKCM dry mill, which is still another couple of weeks.